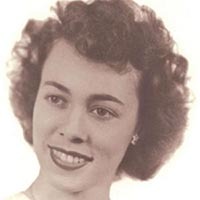 Mary Ruth Phillips Heafner, age 91, passed away on March 31, 2019, in Greensboro, N.C. She was born on June 16, 1927, to Cordova Quesenberry and William Lewis Phillips of Indian Valley in the beautiful Blue Ridge Mountains of Virginia. Her family moved to Floyd, Va., where she graduated in 1945 from Floyd High School, being voted by her classmates with the Class Superlative, Biggest Flirt. Ruth taught at the Shady Grove one-room school and later while serving as Office Deputy Commissioner of Floyd County she met her future husband George Wesley Heafner. In 1949, Ruth and George married and moved to Norwood, N.C., where they opened a Western Auto business. Ruth worked as the company bookkeeper, volunteered at the First United Methodist Church, served as the leader of the Greenfield Norwood 4-H Club, enjoyed golf and played bridge with the Norwood Couples Club. For many years she played golf at Piney Point Golf Course as well as with the Central Carolina Ladies Golf Association, playing in tournaments around North Carolina. uth had a special talent for arranging flowers, was a green thumb gardener rooting hybrid roses and camellias which she gave special names. She was an excellent seamstress, needlepointed, and loved gourmet cooking, family genealogy, oil painting, antique shopping or going to a good yard sale or auction. She was blessed throughout her life with a multitude of friends due to her friendly and outgoing personality. She was predeceased by her husband, George Wesley Heafner; grandson, David Edmond Wesley Schlosser; brother, William Lewis Phillips and sister-in-law, Freeda; sister, Clara Vae Phillips; sister, Mamie Vest; sister, Helen Mabry and brother-in-law, Elwood Mabry, and infant brother. She is survived by her daughter, Rebecca and husband, Michael Andrew Schlosser, of Greensboro, N.C.; and grandson, Drew Schlosser and wife, Angelique and their children, Andrew, Hudson, and Knox, of Southlake, Texas. She is also survived by her brother-in-law, Earl Vest of Floyd, Va.; sister-in-law, Deen Sipe of Hickory, N.C., and by numerous nieces and nephews. A funeral liturgy will be held 11 a.m. Thursday, April 4, 2019, at St. Pius X Catholic Church by Monsignor Anthony Marcaccio, with visitation at 10 a.m. prior to service. Burial will follow at Forest Lawn Cemetery. Following interment, a gathering of family and friends will be held at her daughter’s home, 908 Sunset Drive. In memory of Ruth, donations may be made to the David Schlosser Endowed Scholarship at Western Carolina University, One University Way, 201 H. F. Robinson Building, Cullowhee, NC 28723, or to the Floyd County Historical Society Museum, P.O. Box 292, Floyd, VA 24091, or the charity of your choice. Online condolences may be made through www.haneslineberryfuneralhomes.com.